Greetings friends and fellow crafters, LeeAnn here with a project I made using Luster Vinyl from Tape Technologies. I have to say every month I love this more and more. Each month we have the opportunity to work with a different vinyl type and bring our projects to you, and each one is more impressive than the previous. This month, with Christmas coming fast, I decided to make a place for my grandchildren. This plate can be used for years to come and bring happy memories each year. 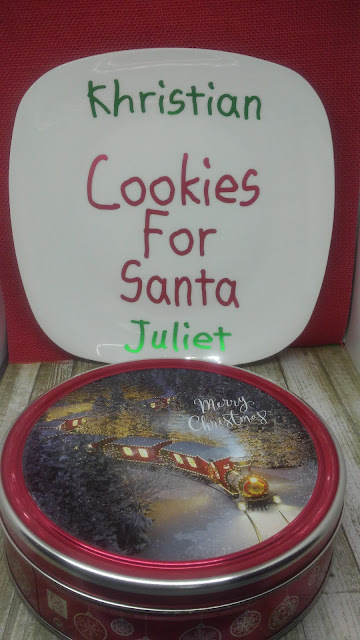 Khristian is 3 and Juliet is only 1, but the memories of this plate each year as they make cookies with mom and dad and leave them when going to bed, and the crumbs left behind when they wake up will never be forgotten. Using the Software that came with my Brother Scan N Cut I used First Grader Font to type out the words, arranged them on the screen so the least amount of vinyl would be used in order to have less waste. I sent the design to cut and then was able to weed the project without issue. I then was able to use the transfer paper to pick up the design and place on the plate easily, rub it down and remove the transfer paper. This Luster vinyl has such a shine to it that I love, and it even shows in the photo. Make sure to check out the rest of the teams projects as well, they are all awesome. Happy Holidays Everyone, see you back in 2018!!! Love how you made this plate!